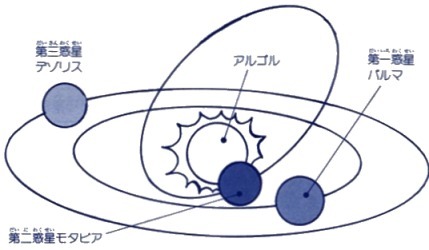 On page #23 of the Japanese Master System instruction manual of Phantasy Star, the player is introduced to the Algo Solar System for the first time. Each of the three planets and the start are labeled. The orbital path of the planets is also shown. Motavia is the planet with the vertically slanted orbital path, Palma is the second planet out from the star, and Dezoris is the third and final planet shown.